The subject matter of this post is controversial as it discusses extracting computing resources from the visitors of a website. There are a lot of discussions at the moment centered around web-browser based crypto currency mining. Most paint a deplorable picture of the practice; please keep in mind that there are very desirable paths alongside which these practices can develop. I am not elaborating on these arguments here, I am only describing a method to harness the resources. Just like a regular computer cluster, the nodes all participate in a coordinated fashion to solving a single problem. Unlike a regular computer cluster, the nodes are very ephemeral (as website visitors come and go) and can’t talk to each other (no cross site requests). The problem being solved here is the hashing of 380,204,032 string permutations to find the reverse of a given hash. Problem parameters were chosen to make heavy processing quick for the clients. At the core of the idea is the websocket technology. It creates a persistent connection between a server and all of the nodes (the visitors of your website). This connection can be used to orchestrate actions between the nodes so that they can act as a concerted entity. From delivering the code to passing messages for coordination, websockets are what make everything possible. So we’ve established that websockets can be used to dynamically deliver code to be ran by the nodes. It can also be used for message passing and the overall orchestration of distributing the problem to be solved. Every distributed problem is different and crackzor itself isn’t a magic way to distribute any problem to be solved. The magic of crackzor is its ability, given a space of character permutations, to divide it up in chunks which can be processed by the nodes. Given the problem, a start iteration and end iteration, a node can get to work without having to be provided the permutations themselves, thus removing the bandwidth bottleneck. 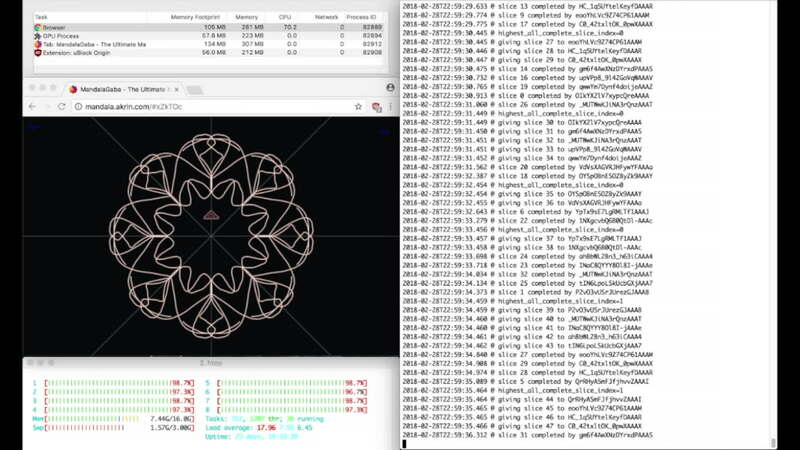 The first challenge: maximizing usage of the node’s CPU. This work is obviously up to the websocket server along with subsequent coordination. Without going into too much details, the websocket server keeps track of all the nodes as they come and go, it also keeps track of which ones are working or not, allocates new chunks of the problem to nodes as they become available. Thus arrive the 2nd and 3rd layers of encapsulation, the code which will be distributed to the nodes is in a file which is to be evaled on the websocket server side and sent over the websocket to the clients. once the packaged problem to be solved shows up on a node, it is evaled and it contains threading to maximize CPU usage. all the pieces you need to make a super computer from your web traffic. I’m choosing not to publish the full code of my implementation for reasons of readability, security and complexity but I can go into more details if asked. The same way that peer-to-peer protocols made any data available anywhere any time, could this do the same for computing power? Mind=blown, and your CPU along with it. When encapsulating out the wazoo, keep in mind that Internet Explorer (Edge or whatever it’s called today) doesn’t support backticks. Syntax highlighting will be confused by the strings in strings in strings of encapsulation, it helps to just turn it off. I found it necessary to keep track of an average time to solving a chunk so that I may exclude the nodes which are taking too long and polluting the good performance of the supercomputer. There’s definitely a company to spin off from the idea :). Computing power is becoming a more and more relevant resource nowadays. now turn it into a network that sells compute time and allow content creators to make money with computing power instead of ads — with visitor’s consent. what Salon is doing, but at auction, anywhere, and for anything, not just crypto. That’s a great way to take care of the traffic and do something better. I always had a similar concept in mind, to have some sort of tracker and all the processing to be done by the client side. Sadly, not everything will be available and security will be a big issue, but it’s a fun hacking experiment. Thanks for sharing this, I hope you’ll come up with new experiments in the future. You cannot really trust the browsers, because people might mess with the code in their browser to send you back bogus results. Someone who is angry that you’re using their CPU might want to do this to get revenge, or just for lulz. To get some level of trust you might have to send the task to multiple browsers and take the most common answer. But if the attacker has a lot of browsers, you might end up sending the request multiple times to the same attacker. Cryptocurrency miners don’t really have this problem because it’s a task that takes a fairly long time to compute (find a block with a hash that complies with the difficulty) but only a tiny time to verify (verify that the block has a hash that complies with the difficulty). This is the core idea behind bitcoin mining: proof of work that takes time to do but can be verified easily. While password cracking in a way seems very similar to cryptocurrency mining, there is an important difference. There is only 1 possible correct password (ignoring hash collisions), but there are infinite equally-probable blocks that comply with the cryptocurrency difficulty. So with password cracking the domain needs to be split between the browsers, and if one browser misbehaves, its range won’t have coverage and if the password was in that range, you’ll never find it. But with cryptocurrency mining, no organized splitting is necessary, just randomly assign browsers ranges from a huge domain, and if one browser misbehaves, it’s no worse than if that browser never joined. you are right, recently I was thinking about something like ddos mining, where you buy tickets for the prize – funded by the attacker – giving proof_of_handshake with X website in time range Y, to the pool. Then you have to trust the pool for the payout, even if at least you can create some proof of past honesty. I find quite incredible nobody still does this, it’s like security through obscurity but on the non-scalability side, of current ddos, surely to speed the internet development an anti-protocol is needed imho. today , I very Surprise that you have the same idea. in 2016， public the code on git , and upload the video, later for some reason, i delet all. Welcome to the internet where there is no such thing as an original idea. Implementation & presentation are far more relevant in bringing ideas to the forefront. Verification is definitely a challenge of turning this into a viable technology as many other commenters pointed out, I’ll be curious to see what you come up with. Salut, merci pour le commentaire 🙂 Pour l’instant je ne compte pas travailler plus loin que cette preuve de concept mais je veux bien partager du code en plus que ce qui est présent dans mon article si cela t’interesse. Comme je le dis vers la fin, c’est difficile a partager tout le code dans un package car il y a pas mal de complexité. Certaines parties sont du coté du client, d’autre du coté du serveur, d’autres encore sont volatiles. Il serait très difficile de comprendre comment tout mettre en place si je te donnais ce que j’ai maintenant. Par contre, avec l’article comme plan, je suis content de partager les pièces du puzzle alors qu’elles te deviennent necessaires. Elles seront alors beaucoup plus faciles a implementer dans leur contexte. Ce qui m’intéresse n’est pas un super serveur capable de gérer tous les calculs de «node», mais un système informatique qui n’a pas d’entités mais qui ne s’appuie que sur ces «node». C’est-à-dire, il est basé sur l’informatique distribuée non centrale, et il n’y a pas de super planificateur (le server qui contrôle les node).